With Saronic Islands day trips from Athens you visit three islands – Hydra, Poros and Aegina. If you’re short on time and really want to see more than one island in an organized, semi-escorted way, this is a good way to do it. On the other hand, you spend a lot more time traveling between islands and boarding and disembarking than you do on the islands. 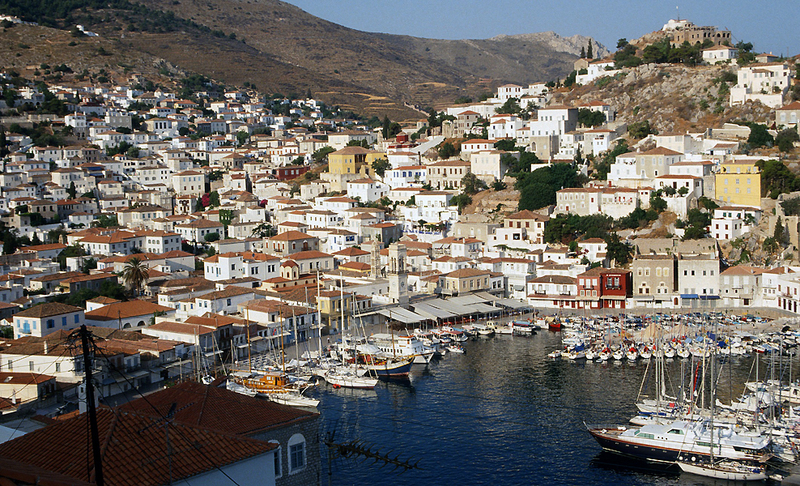 Personally, I’d rather have time to linger and soak up one place, and Hydra would be that place. Hydrofoils depart several times a day from Athens’ Pireaus port during the tourist season (March/April-October). The one-way trip takes about 1 ½ hours. The island is idyllic, with the pretty, whitewashed town tucked between amphitheater hills and the harbor, cobbled roads and no motorized traffic – the perfect recipe for lazy poking around and a long harbor-view lunch. This entry was posted in Greece and tagged Athens, Greece, hydra, saronic islands by yalla2013. Bookmark the permalink. Thanks Simon! What’s the name of the hotel you like in Hydra? We’ll take note. – Guesthouse manager was so helpful. Boiler did not work first day. I left a note and by the time I got back it had been sorted. – The guesthouse also left me a walking book which was really helpful. The room was very nice and had perfect wifi. – The shared panoramic roof space ha beautiful views of the town and back over the Peloponnese at dusk. – The Icons has an arranged discount deal with a dinner place on the harbour – and that was good (even though there are plenty of nice restaurants to choose from in the twon. – Walking on the island is incredible and guesthouse manager is a good source of information. – A storm hit and I was stuck on the island, unable to get back to Athens for my flight. Icons could not have been more helpful!